In around two weeks, I am returning to Strathcarron to continue my walk that effectively began in 2015 in Edale with the start of the Pennine Way. Having completed this epic trail, I decided to continue the hike last year by returning to Kirk Yetholm and continuing the walk for around 310 miles across Scotland via a section of the Scottish National Trail, the West Highland Way and finally finishing at Strathcarron on the Cape Wrath Trail. It is this last trail that I am returning to complete on the 22nd May. I have already had a tough baptism on this trail through Morar and Knoydart and I am now itching to get back to complete what is considered the UK's toughest hike. I have made one or two changes to the kit I will be using for the hike, the main one being the purchase of a new, lightweight Montane Ultra-Tour 55L rucksack to replace my very good, albeit fairly heavy, Berghaus Verden 65L. 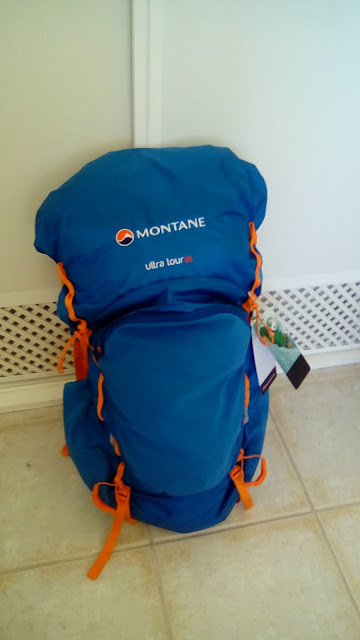 Because of this and one or two other changes, I have managed to reduce my base weight to around 7 kilos, which while not 'ultra-light', achieves for me what I feel is a good compromise between weight saving and comfort. I have the route I am planning to take fairly settled in my mind now although certain alternatives will be decided upon according to the weather conditions on the day. After my (hopefully) completion of the Cape Wrath Trail, I will be heading south to Cumbria to start walking the Coast to Coast walk with my wife. This will be a completely different hike to the Cape Wrath Trail as there will be far more people on the hike and each night we have a hotel or guesthouse booked.